If you could seal your leaky flat or low-sloped roof without replacing it, would you do it? 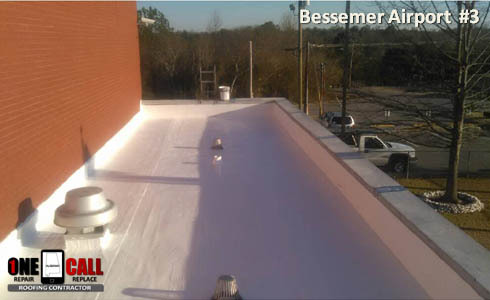 With today’s white roof coatings, Birmingham area business owners are doing just that! When professionally applied, it lasts a really long time and can even reduce your heating and cooling costs. your leaky commercial roof quickly and affordably. Call for a free written estimate today! 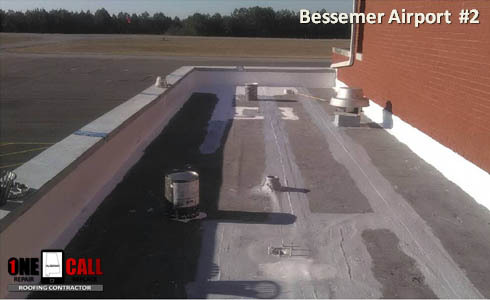 Our cool white roof coatings are perfect for low-sloped or flat roofs that are covered with metal, TPO, tar and gravel or rolled asphalt roofing. Flat roof gets cleaned and prepared for the coating. Roofing seams, edges and drainage areas get reinforced and primed. The professionally finished white roof coating on this flat roof is waterproof, long lasting and beautiful. 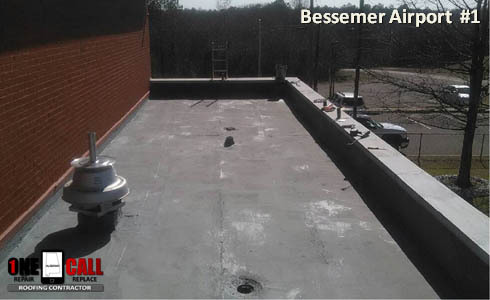 If you own a residential or commercial building with a flat or low-sloped roof, we’re the Birmingham area roof coating contractor to call first. In addition to being BBB A+ Rated and having a bunch of positive Google Reviews, we’re also one of the highest rated roofers in North Central Alabama.